You know it is a high stakes game when you put all your eggs, meaning all your hard-earned savings, into a single basket, or asset class. And still the temptation to ignore the sage advice remains. Financial news networks blast headlines about stocks to buy now, and the urge to make a trade increases as the feeling of missing out on a money-making opportunity grows. But when stock markets crash, having all your eggs in one basket can lead to financial ruin. It’s one thing to get a little too greedy when the economic climate is rosy but when it is cloudy, it is best to have your eggs spread among many baskets. Smart Asset Allocation: Which Eggs Go Into Which Baskets? How Should You Allocate Savings Across Asset Classes? Which Eggs Go Into Which Baskets? Asset allocation is the process of choosing which eggs to place into which baskets. But how much savings should you allocate to each category? Should you choose stocks or bonds? Commodities or money market funds? Depending on your risk profile, time horizon to retirement and living expenses, your allocation will favor a higher percentage of equities or bonds. Generally, younger investors with longer time horizons put more eggs into the equities basket while retirees seeking income over growth favor a higher percentage of bonds and money market funds. A rule of thumb is to have at least a 50:50 split of bonds and stocks when approaching retirement. You want to avoid a situation where you are heavily invested in equities and retiring just when the market has peaked and may be on the verge of a big fall. As tempting as it may be to find the next Facebook or Twitter, keeping some powder dry by allocating to income-generating investments, such as bonds, is prudent. Within the equities basket, consider diversifying your stock holdings by purchasing the best index funds rather than holding a concentrated portfolio of just a handful of stocks. The odd gamble from time to time with a small amount of disposable money may not break the bank, but it would certainly be a mistake as a long term strategy. If you are tempted to trade a concentrated portfolio of fewer stocks, explore ways to generate income from covered calls and limit risk by applying married put options strategies. When you buy stocks, your portfolio will rise and fall based on the combined performance of the stocks you hold, which in turn is related to the profitability of the companies in your portfolio. Bonds are an attractive way to generate a predictable income because they pay a predictable yield at regular intervals. For retirees depending on a fixed income to pay the bills day-to-day, this feature makes bonds more attractive than stocks. Government bonds are widely believed to be the safest asset class because the likelihood of the U.S. government defaulting on its debt is perceived to be low. Still, bond investing is not without risks. Some countries have defaulted on their debt – Argentina is the poster child for frequent sovereign debt defaults. Municipal bonds are the next least risky bet and are attractive because interest earned on munis are often exempt from state taxes when you live in the state that issues them. Municipals are not without some risk either so, before diving in, make sure the state’s finances are in good shape and no pension crisis is looming as has been the case with states like Illinois. It is best to diversify your bond holdings also by spreading risk among government, municipal and corporate bonds. You can often find corporate bonds paying reasonable yields that have low default risk, like those issued by solid companies such as Apple. >> Investing Tip: How Does A Fed Rate Hike Affect Your Bond Investments? Money market funds fall under the umbrella of the Cash asset class. Along with savings accounts and certificates of deposit, these are among the most conservative places to store your money, but equally they tend to pay the lowest yields. Cash is useful to have on hand when you need to put a downpayment on a home or you need to pay for life events, such as weddings, as well as college tuition costs and so on. But keeping all your eggs in a cash basket won’t do you favors over the long-term to grow your wealth. The rate of interest you can earn is so low that inflation often exceeds your savings rate, meaning your purchasing power diminishes over time. Just think back to the cost of a bag of chips from your childhood and compare its cost today. Inflation creeps up slowly but steadily and is a powerful force that impacts nominal wealth. The rule of thumb is that every 20 years or so, purchasing power is cut in half. So, the dollars you need to live a good life now will need to double to enjoy a similar lifestyle then. Commodities are well known as a volatile asset class, so they generally form only a small portion of most investors’ portfolios. Historically, the price of oil, gold, precious metals and other commodities have been known to soar and plummet quickly as the winds of economic fortune change direction. The first step in figuring out how to allocate your savings to various asset classes is to calculate how much you need to save. Once you have an idea of how much you need to save each month to reach retirement, you can start to think about how to invest your savings across asset classes. Which eggs should you put in which baskets? And how many eggs should go into each basket? The simplest way of allocating your money is to sign up with a robo advisor who will ask you some questions relating to your age, risk tolerance, financial goals, and lifestyle expenditures. Leading robo advisors, such as Betterment and Wealthfront, automatically invest your money across various asset classes in alignment with your risk and reward objectives. You don’t have to lift a finger. They automatically perform tax loss harvesting on your portfolio to minimize the tax impact from capital gains. And many have financial tools and calculators to help you reach retirement comfortably. If you choose to take charge of your own investing in a brokerage account or retirement account, the first step will be to set a time horizon. When do you realistically believe retirement is possible? Does retirement mean owning a nice home, having a family, and living off of a sizeable nest-egg? If you don’t yet own a home, take a candid look at how long it will take to buy one. 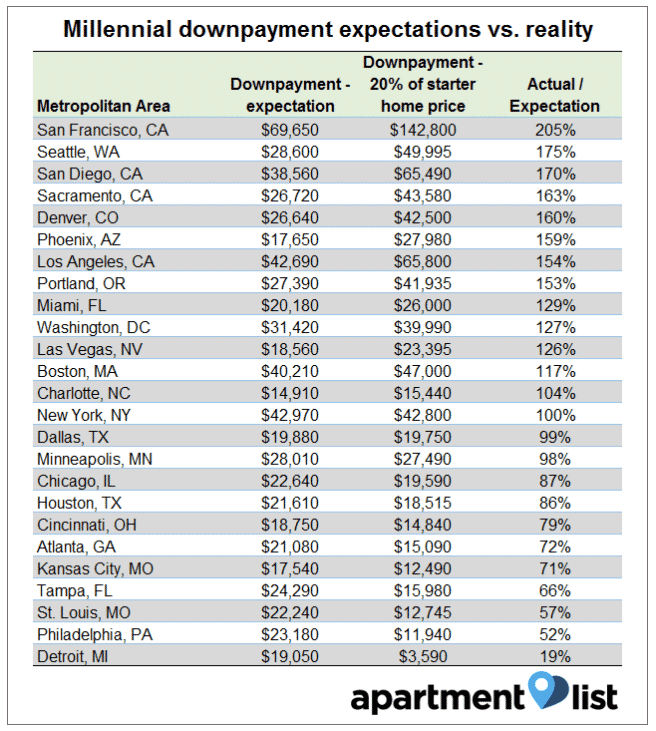 A study by ApartmentList showed how expectations and reality are starkly different among Millennials with respect to how much savings are needed to buy a home. When you take an honest look at the numbers, the length of time needed to save for a new home is often longer than expected. 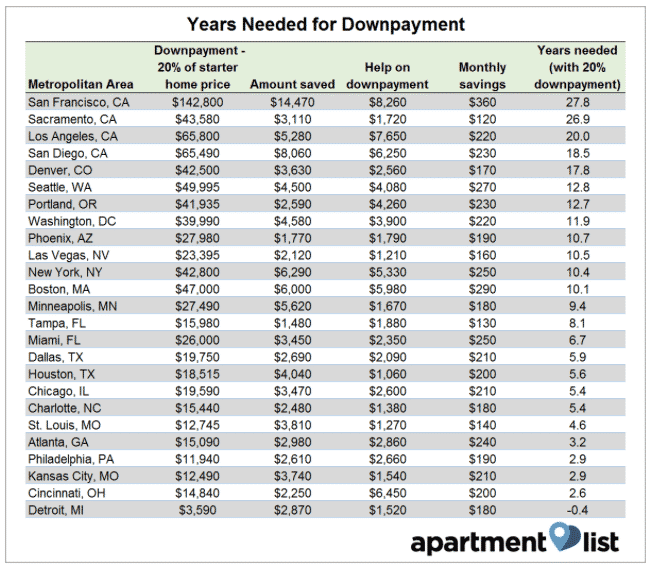 Many millennials will need more than a decade to save the 20% needed for a home downpayment. If you already own a home, and are supporting a family, squirreling away a monthly amount for retirement is crucial to realizing your financial goals. If you have time on your side, you can ride out the market swings and can look to a higher percentage of equities. If you’re in your early twenties, thirties, forties, fifties or beyond how much should you invest in equities? This simple formula is just a rule of thumb but it’s a helpful one. The balance you should invest in bonds. So if you are 25, then an allocation of 75% equities and 25% bonds would be appropriate. A 65 year old retiree should look to a balance of 35% equities and 65% bonds. A 35 year old would then invest 75% in equities and 25% in bonds. With your equity and bond percentage allocation selected, you might be wondering how much to allocate to cash. A good rule of thumb is to have at least six months of cash on hand. So, if your monthly expenses are $4,000 then you probably want around $50,000 on hand to dip into in case of emergency. How have you spread your money across asset classes? Are you on track to hit your retirement goals? Share your investing experiences with us, we would love to hear from you in the comments below.